Written and Directed by Rian Johnson. 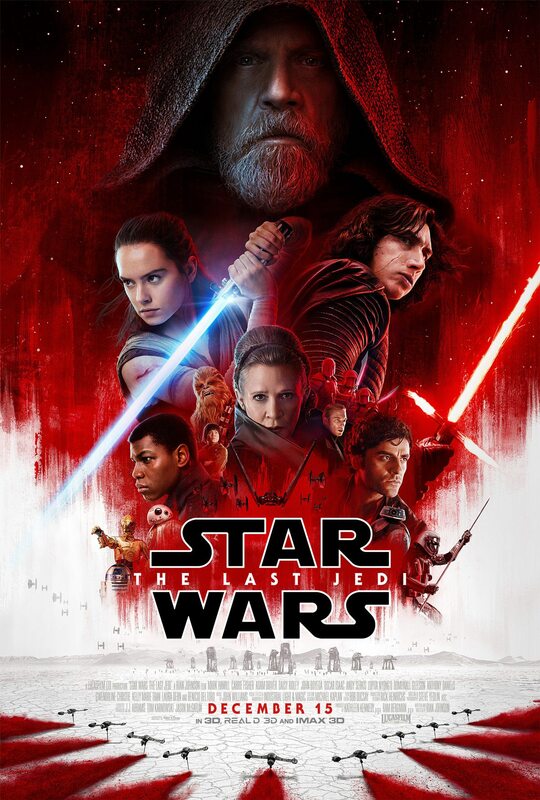 Starring Daisy Ridley, Mark Hamill, Adam Driver, Carrie Fisher, Andy Serkis, Domhnall Gleeson, John Boyega, Oscar Isaac, Peter Mayhew, Anthony Daniels, Laura Dern, Kelly Marie Tran, Benicio del Toro, Billie Lourd, Gwendoline Christie, Lupita Nyong’o, Jimmy Vee, Tim Rose, Warwick Davis, Hermione Corfield and Veronica Ngo. One of the big complaints about Star Wars: The Force Awakens was that it felt like an old band having one last run with a new singer (say, Queen for example). They played the old hits, the stuck to the same chord structures and they didn’t try anything too new in case people just wanted to hear the favourites again. While this reviewer thinks that it is an overly harsh criticism of J.J. Abrams’ seventh part of the saga, Star Wars: The Last Jedi is that same band but with a new singer. And this new singer wants to take risks. This new singer wants to play the same songs, but change the tempo and shake things up a bit. This is also a new singer that creates a captivating canvass with untold amounts of twists and turns, shocks and surprises. Wait, I’ve stretched this metaphor too far and now it doesn’t make sense. Look, Star Wars: The Last Jedi is freakin’ incredible. Taking place moments after the 2015 $2 billion dollar smash hit, Star Wars: The Last Jedi is split into three main storylines that all brilliantly connect into each other and allow for humongous character growth for everyone involved. The first story has The Resistance being chased down by The First Order, with Leia Organa (Carrie Fisher) and Poe Dameron (Oscar Isaac) clashing over how to survive this onslaught, while the second and third take place on Ahch-To – the island where Rey (Daisy Ridley) found Luke Skywalker (Mark Hamill) at the end of the last movie. Rey wants to convince Luke to join the rebellion but, like The Incredible Hulk, Luke Skywalker just wants to be left alone. This ties into Rey’s connection to The Force, and a third storyline that I won’t mention here for fear of spoiling anything. But, let it be known that it’s pretty terrific. By now, everyone in the cast is more comfortable in their roles. Ridley is far better here than she was in The Force Awakens (where she had a bad case of early-career Keira Knightly about her) and she excels in some of the more challenging character scenes. She also looks like a total badass. John Boyega is consistently great as Finn – though still a little too jokey, more on that later – and Oscar Isaac is predictably fantastic because, well, he’s Oscar Isaac. His scenes with Fisher’s Leia are among the very best, and he bounces off her perfectly just as Ridley does with Hamill. Boyega doesn’t have an old classic to work with, however, instead playing off against newcomer Rose (Kelly Marie Tran), a tremendous new addition with a brilliantly loveable performance. From the moment she walks on screen your eyes are drawn to her, and she gives a very effective performance to make Rose an instant favourite. 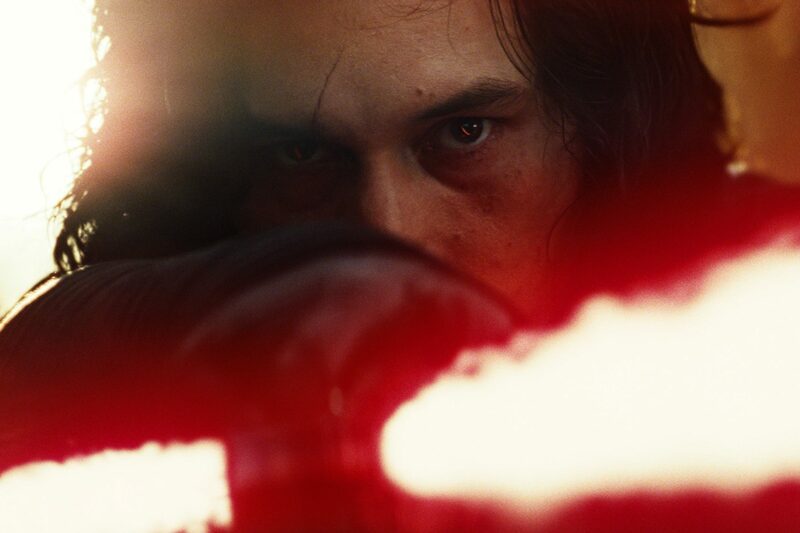 Adam Driver (the Vader obsessed Kylo Ren) is also superb, building on the foundations created in The Force Awakens, this is a much different Ren. He’s angrier, he’s meaner, he’s more unhinged. But yet, there is something more to him as he’s taunted by Supreme Leader Snoke (this time not a hologram and in living colour via Andy Serkis motion capture ). Serkis again shows why he’s the master of this art, breathing life into Snoke that was missing the last time around and providing a menace the franchise needs. Like The Emperor before him, he is the perfect puppet master. But what about Mark Hamill I hear you ask? Well, it’s wonderful to have him back in our lives. 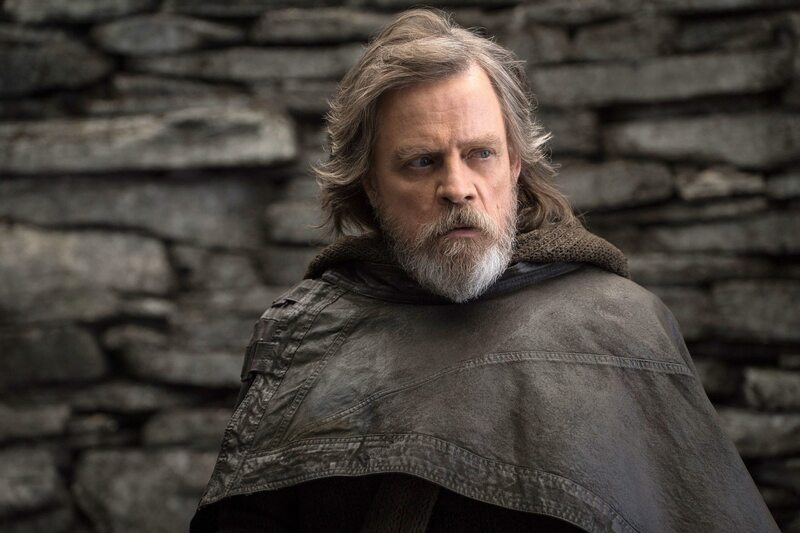 Hamill’s quietness is mesmerising, and his subtle performance adds a whole new dimension to Luke – a pretty two-dimensional character at best. He is more than just a simple farm boy who got involved in the rebellion against The Empire, he now feels responsible for everything falling apart. It’s the best outing he’s had in the franchise to date, a wonderful and thought-provoking performance with incredible twists and turns. And speaking of familiar faces, this reviewer would be lying if he said tears did well in his eyes whenever Carrie Fisher’s magic graced the IMAX screen. That, or someone was cutting a lot of onions around me. That’s it, it was the onions. Bloody onions. And all of this comes courtesy of director Rian Johnson. It’s not been an easy ride for a director in the Disney era of Lucafilm (just ask Gareth Edwards, Colin Trevorrow, Phil Lord, Chris Miller or Josh Trank), and Johnson – by all accounts – is the first director to not be questioned on any of his choices or be overseen by a third-party director. And that shows in Star Wars: The Last Jedi. This is all one man’s vision, and it’s utterly wondrous. From the very opening moments of the movie, any cynical film fan will be transported back to the first time they saw Star Wars as a child, eyes transfixed to the action in front of them. The opening of the movie is in fact a giant space battle, but unlike the one in Star Wars: Episode III – Revenge of the Sith, this isn’t a blubbering mess of CGI and one-note dialogue. The action is crisp and clear, and some of the best we’ve seen in blockbuster cinema all year. He also has a wonderful sense of style about him, unafraid to take bizarre deviations from Star Wars’ regular pattern to try something new which brilliantly succeeds. It’s Lynch-ian, trippy and weird, and yet melds perfectly with everything else around it. Johnson uses colour beautifully too, creating some of the most captivating images from the entire Star Wars saga. However, there is one draw back. 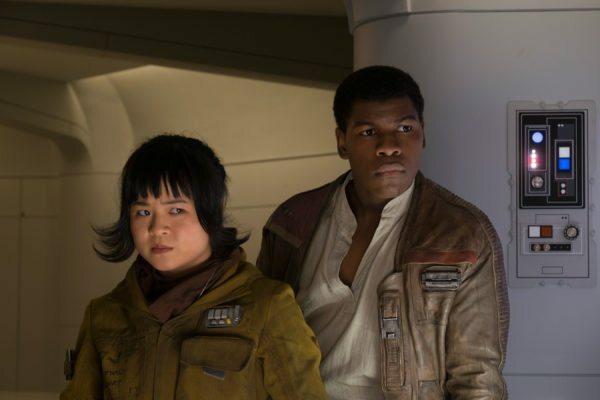 A holdover from The Force Awakens and a plague that infects seemingly every movie with a big budget in Hollywood: The insistent need to punctuate scenes – even ones with incredible dramatic tension – with a punchline. Within the first five minutes there is an attempt at a joke, and like Poe and Ren’s “who goes first” diatribe in The Force Awakens, it’s disastrously misplaced and takes you out of the moment. Thankfully the punchline curse isn’t as common as other Hollywood blockbusters (the Porgs aren’t in the film as much as the marketing would have you believe either), but it is still an issue. But here’s the thing, sometimes those flaws are easy to overlook because everything else is so darn good. Like, flawlessly good. Even the film’s excessive runtime (it’s the longest Star Wars film to date) doesn’t detract from some outstanding sequences. Just when you think the movie can’t top what came before it, Star Wars: The Last Jedi keeps going and keeps getting better. Star Wars: The Force Awakens felt like seeing an old friend who had a few new quirks about them. Star Wars: The Last Jedi is that same friend, but they’ve improved everything about themselves and you want to see them more and more. This isn’t just a continuation of a 9-part story, it feels like a whole new beginning. These words do not come likely – and repeat viewings will cement this – but Star Wars: The Last Jedi could be the best Star Wars film ever. Seriously. Luke Owen is the Deputy Editor of Flickering Myth, a presenter for WrestleTalk, and the author of Lights, Camera, GAME OVER! : How Video Game Movies Get Made. You can follow him on Twitter @ThisisLukeOwen. I don’t follow this since TLJ followed the template of the OT as much or more than TFA, except that it did not reference or develop TFA at all, explore Rey’s character at all, or present a remotely believable version of Luke Skywalker; nor did it even acknowledge the events or reflect the impact of the events of TFA that had supposedly just happened, i.e. the tremendous blow to The First Order via the destruction of its behemoth planet-sized weapon. I found TLJ to be poorly written, poorly plotted and, in terms of character, absolutely ridiculous.